More than any other artist, Walker Evans invented the images of essential America that we have long since accepted as fact, and his work has influenced not only modern photography but also literature, film and visual arts in other mediums. 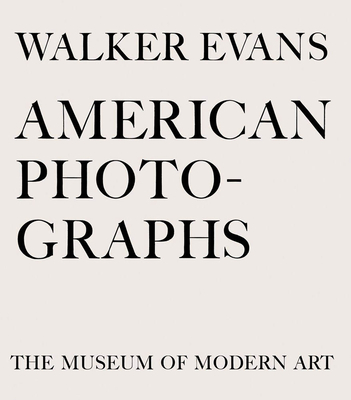 The original edition of American Photographs was a carefully prepared letterpress production, published by The Museum of Modern Art in 1938 to accompany an exhibition of photographs by Evans that captured scenes of America in the early 1930s. As noted on the jacket of the first edition, Evans, "photographing in New England or Louisiana, watching a Cuban political funeral or a Mississippi flood, working cautiously so as to disturb nothing in the normal atmosphere of the average place, can be considered a kind of disembodied, burrowing eye, a conspirator against time and its hammers." This seventy-fifth anniversary edition of American Photographs, made with new reproductions, recreates the original 1938 edition as closely as possible to make the landmark publication available for a new generation. American Photographs has fallen out of print for long periods of time since it was first published, and even subsequent editions--two of which altered the design and typography of the book in small but significant ways--are often available only at libraries and rare bookstores. This version, like the fiftieth-anniversary edition produced by the Museum in 1988, captures the look and feel of the very first edition with the aid of new digital technologies. Walker Evans (1903-1975) took up photography upon his return to New York in 1927, following a year in Paris when his aspiration to become a writer withered in the shadow of Fitzgerald, Hemingway and Joyce. In 1935, Evans was commissioned by the Farm Security Administration to photograph the effects of the Great Depression in the Southeast. During this time he took many of the photographs that appeared in his collaboration with James Agee, Let Us Now Praise Famous Men (1941), a book which has become a defining document of that era. Evans joined the staff of Time magazine in 1945 and shortly thereafter became an editor at Fortune, where he stayed for the next two decades. In 1964, he became a professor at the Yale University School of Art, where he taught until his death in 1975.